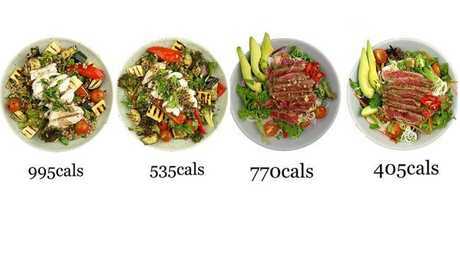 EATING healthily isn't always as easy at it looks. You know that feeling when you've been eating salads for lunch everyday and sticking to meat and three veg at night, but the weight just isn't shifting. Many health experts suggest some of us need some help with our portion control. Even if you're eating healthy foods, you can have too much of a good thing. A popular Instagram food account shows how just a few small changes can add or reduce calories in your meals. Aussie dietitian Paula Norris's Instagram is proof of that. Her "spot the difference" posts show us how adding or removing just a few ingredients from our plates can make a massive difference when it comes to a meal's overall calorie intake. For example, take a look at one of her most recent Instagram posts. As Paula explains, calorie heavy dressings, too many grains and not enough vegetables can result in a salad with "calories closer to that of a risotto". Even though all the ingredients are healthy whole foods, portion control still had a massive impact. Check out some of her other examples on Instagram.